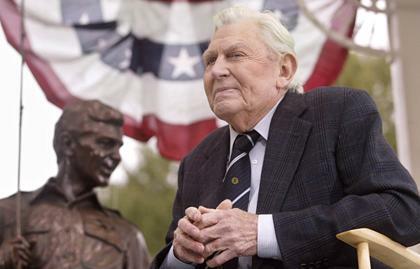 Beloved actor Andy Griffith died this morning. Former UNC President Bill Friday says The Andy Griffith Show and Matlock actor died at his home in Dare County, North Carolina around 7 a.m.
Friday, who is a close friend of the actor, confirmed the news to WITN News . Emergency medical crews responded to Griffith's home this morning, Dare County Sheriff J.D. Doughtie told WAVY.com . UPDATE: 12:10 p.m . The Virginian-Pilot cites "two close friends" - Eddie Greene and W. Ray White - as confirming Griffith's death. AP says Sheriff Doughtie confirmed the news. Griffith, who was born in Mt. 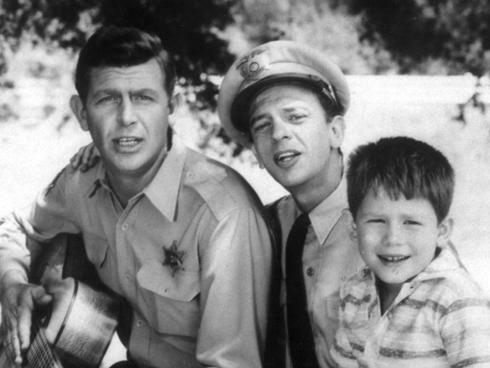 Airy, N.C., was launched to fame as Sheriff Andy Taylor in The Andy Griffith Show for CBS from 1960-1968. On the show, Ron Howard played his son, Opie. He starred on other shows and in films, but found his greatest success again with legal drama Matlock , from 1986 to 1995. He played the title character, Ben Matlock. In 2000, Griffith underwent quadruple heart-bypass surgery and in 2007 had hip surgery after a fall. Griffith and his first wife, Barbara Bray Edwards, married in 1949. They were divorced in 1972 and she got custody of their daughter Dixie and he got custody of son Sam, who died in 1996 after years of alcoholism. His second marriage, to Greek actress Solica Cassuto, lasted eight years, from 1973 to 1981. He and Cindi Knight were married on April 12, 1983, when she was 27 and he was 56. A private man, he told the Virginian-Pilot in 2008 in a l engthy profile by Mal Vincent that he's friendly and outgoing to a point, but has been known to turn down requests for autographs. "When my wife, Cindi, and I go somewhere and we don't want to be recognized. She says, 'Don't talk.' "
Ron Howard : "Andy Griffith His pursuit of excellence and the joy he took in creating served generations & shaped my life I'm forever grateful RIP Andy"
Rodney Atkins : "Rest In Peace Andy Griffith. Praying for his family, friends and fans." SouthernLiving : "Rest in peace Andy Griffith. Mayberry will always have a special place in our hearts." Lady Antebellum's Hillary Scott : "Heaven gained a talented man today. Mr. Andy Griffith, thanks for giving me amazing memories with my family growing up watching your show!" Amy Grant : "From Team Amy - Go Rest High on that Mountain, Andy Griffith." Dave Coulier : "RIP Andy Griffith. Thank you for all the laughs. 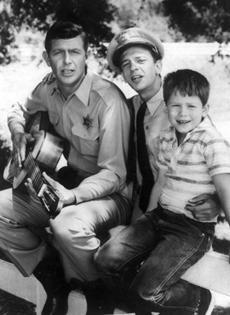 I love Mayberry, and never knew that R.F.D. was for Rural Free Delivery. #AndyGriffith"